It’s super easy to make up batches of oven dried tomatoes and use them in some totally tempting tomato based recipes. 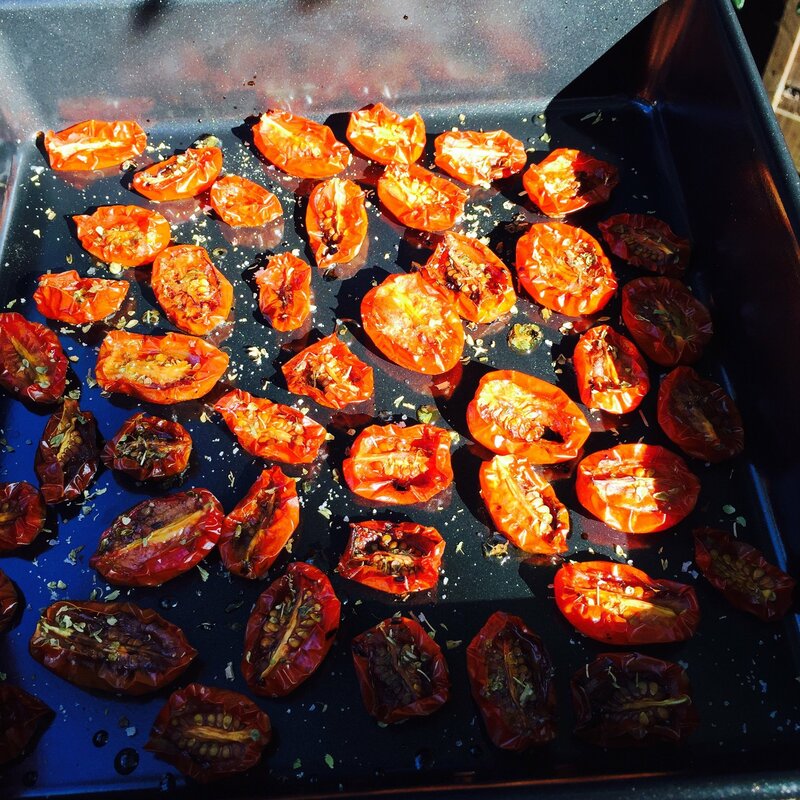 First of all let’s make up a tray of oven dried tomatoes, you can use any of the small varieties of tomatoes you like, my favourites include cherry tomatoes, piccolo tomatoes and baby plum tomatoes or a mix of all three. It’s also nice to use different coloured tomatoes. wash your tomatoes and slice them into halves. lay them into a roasting tin with the cut side facing upwards. scatter over a pinch of sea salt, the tiniest pinch of caster sugar and a good sprinkling of fresh or dried thyme and oregano leaves. drizzle with a scant amount of olive oil. place the roasting tin into the oven and cook for around 3 hours until the tomatoes are semi-dry. Our favourite mouthwatering ways to use oven dried tomatoes. Bruschetta topping – load these beautifully sweet oven dried tomatoes onto garlic brushed bruschetta, drizzle with olive oil and perhaps a shaving of Parmesan cheese. Mozzarella salad – scatter torn mozzarella and oven dried tomatoes onto a small platter, drizzle with olive oil, add some freshly chopped parsley and lemon zest, freshly sliced chilli if you like things spicy. Spaghetti sauce – drop freshly cooked spaghetti into the roasting tin with the oven dried tomatoes and toss to coat in the lovely flavours. Serve with a green salad. 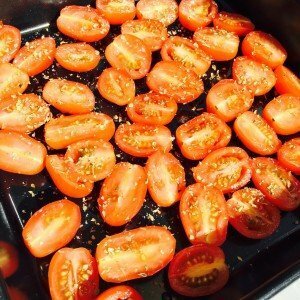 Pizza – whizz the tomatoes in the blender and use as the tomato base sauce on pizza. Top with mozzarella, sliced mushrooms and sprigs of thyme. Antipasti – tip the oven dried tomatoes into a little dish and serve as part of an antipasti spread. Cheese board – delicious alongside crusty french bread, cheese, olives and freshly sliced figs. Stuffed chicken breasts – slice open a chicken breast stuff with tomatoes, wrap with parma ham and bake in the oven for a juicy flavoursome twist. Serve with garlicky mashed potatoes and green beans.